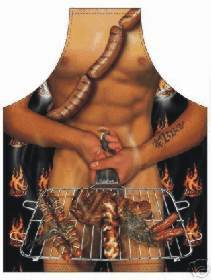 What is it with men and their barbecues? And why is it that nobody ever offers to teach ME how to sizzle meat when I’m at the Home and Garden store? I could learn… honest! I don’t know if I feel hungry or horny. Hmmm. OK, definitely not horny, although that picture . . . No, now I’m not hungry either. Just confused. Remind me to never go to the Home and Garden center without some form of protection. LMAO. This is amusing and all, ya know, but I’m not sure I got any help here. Cause I didn’t learn anything about choosing a new grill and I sure didn’t learn how to pick up any hunks at the Home & Garden center. Maybe if I could go to the H&G with both I could get a great grill and get laid in the process. But that is an outing for another day I suppose. Was that a Polish sausage? Or spicy Italian? Old wives’… so out of touch. Sausage is dirty? Grilling is hot? This is a very saucy post! What marinade do you recommend? Thanks guys,I learned a lot about barbecues….NOT!! Very funny post.